In an ideal world I would go on the next trip only after writing everything about my previous trip. But it is not working that way any longer. 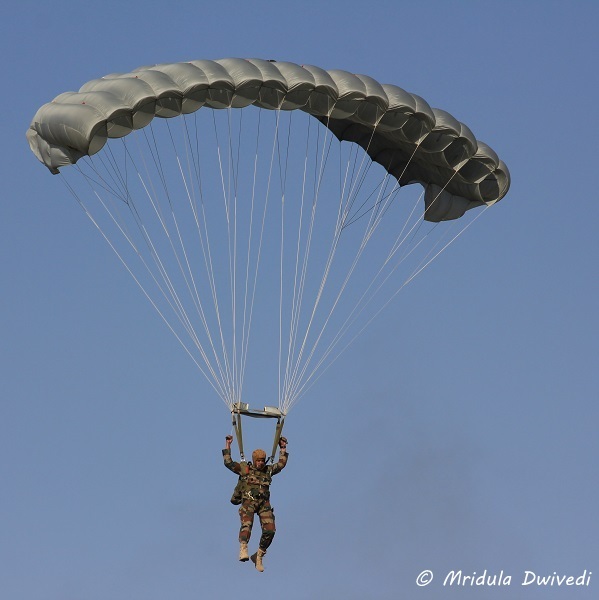 I have already done two trips after I watched the Army Pageant at Rajasthan Diwas in Jaipur. But the memories refuse to fade, so bear with me as I continue blogging in my hotchpotch fashion! I attended the Army Pageant on the second day of the Rajasthan Diwas celebrations. It was a first for me. The word pageant was slightly confusing but right from the start of the show, I caught the drift. 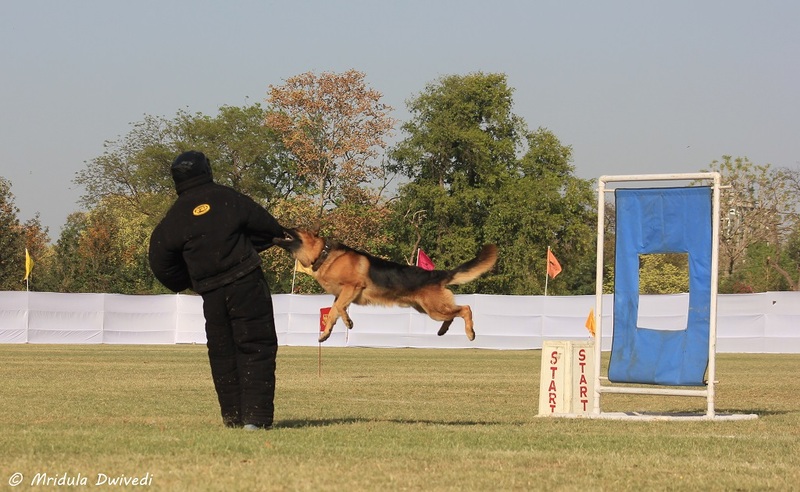 The first display was with the army dogs, there were cute labs and ferocious Alsatians. 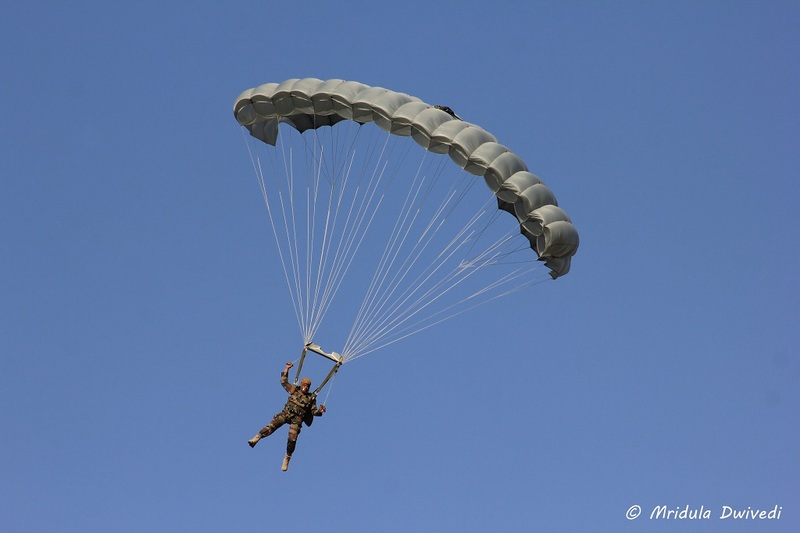 I remember reading a signboard by Army in Ladakh- “What is an adventure of a lifetime for you, it is routine for us”, this skydiving display at the army pageant strongly reminded me of that! And then they came out in numbers on their handsome steeds to dazzle the audience with their skills. It was a wonderful audience too. 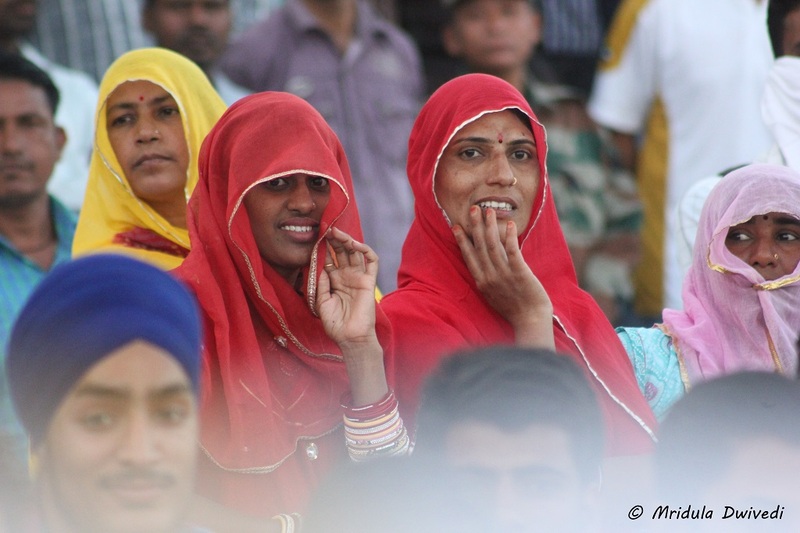 People came out in numbers to watch the pageant at the Polo Grounds at Jaipur. Over in a Flash, Captured for Eternity! For me the biggest dilemma was whether to watch the action packed horse display with my eyes or through the lens. I watched a lot through the lens but honestly everything was a blur. I could see it only when I reviewed the photographs! The eyes regret the decision. 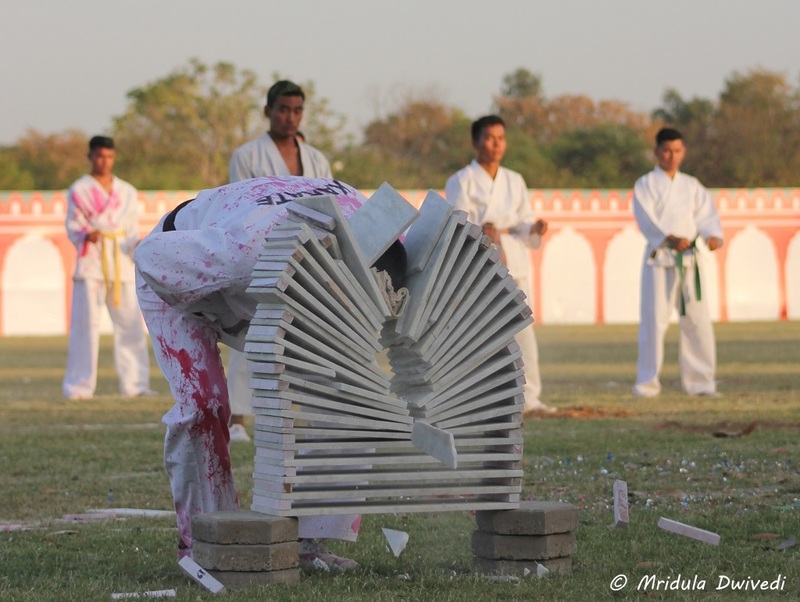 Then there was a display of the traditional art of Mallakhamb! The Men who Mastered Mallakhamb! And here is a lineup of the men who have mastered the art of Mallakhamb! 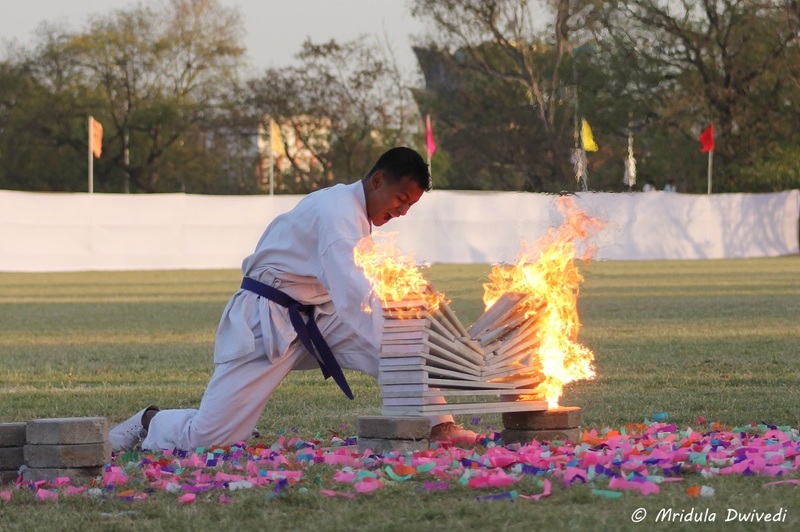 For this young army man, breaking slabs on fire looked like an easy affair. I was awestruck but it was followed by more jaw dropping stuff! They decided hands were just too safe, why not break a lot of slabs using the head? And then they replaced the slabs with ice! I am sure I could keep jumping on them all day but I would not be able to break a single one! The slabs would melt away on their own! 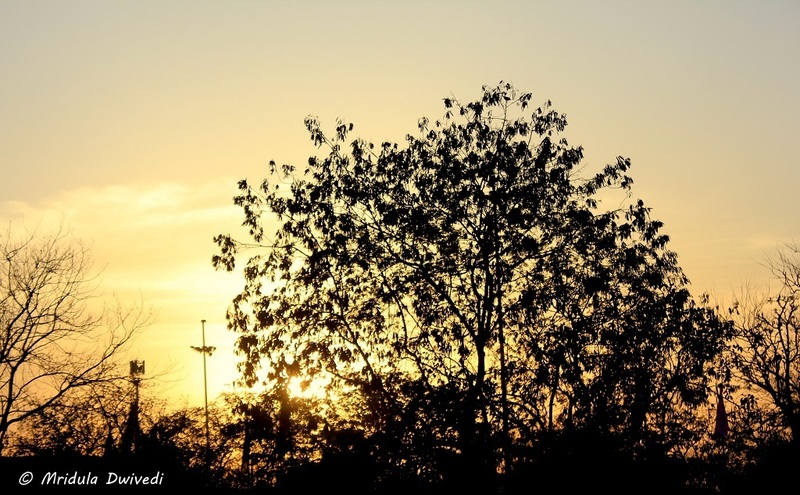 While the sun started on its westward journey, I too had to leave the show and go to attend the other events at Rajasthan Diwas. However, the Army Pageant was one show that is going to remain with me for a long time. PS. I was invited by the Rajasthan Tourism Board to attend Rajasthan Diwas. I always love going back to Jaipur. The most recent trip was extra special as I was invited by the Rajasthan Tourism Board for Rajasthan Diwas 2016 celebrations. The Rajasthan Diwas 2016 had a good mix of events. I could see but only a few of them! The programs would go on simultaneously, so it was not even possible to see everything. I watched a small segment of short films, one session of army pageant, two concerts and one fashion show. Each event was engrossing in its own way. 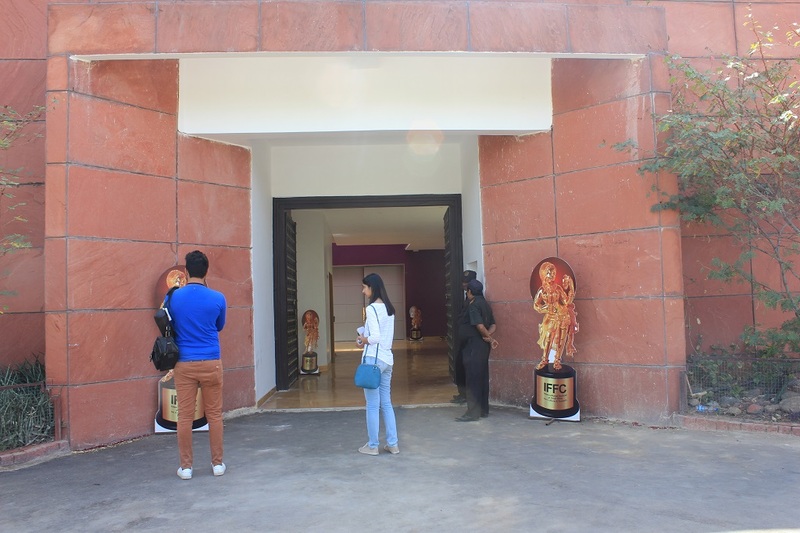 The international festival of short films was held at the Jawahar Kala Kendra. It was held over three days 28, 29 and 30 March. I attended a short session on March 29. I watched The Beginner, Story of the Peacock Saree, Barngngrn Marrangu Story and the Thorns and Silk. I was quite taken in by The Beginner a story from Finland. It was about a bunch of elderly people who decide to learn computers. It was such an everyday story, we all know someone who went through learning computer late in his/her life. But to make a story out of it and to make it engrossing was certainly a work of art. I also quite liked the peak into the life of women in Middle East in Thorns and Silk and their unusual career choices. 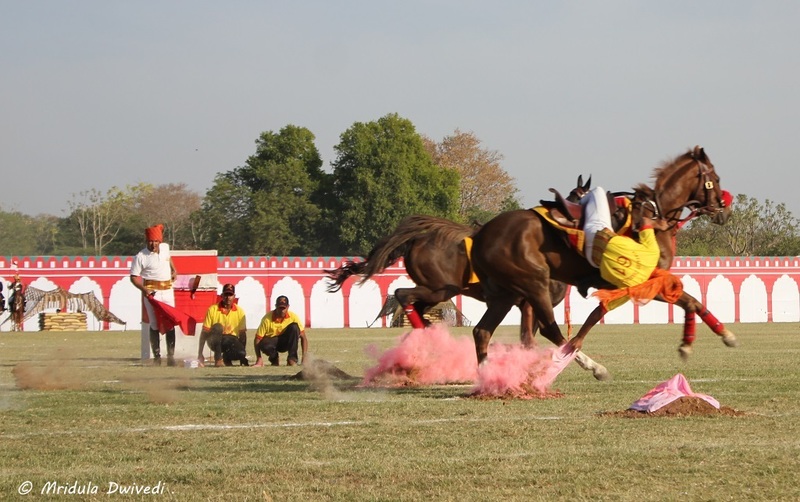 The Army Pageant was held at the JDA Polo Ground. It was held on 28 and 29 March and I attended the 29 March session. 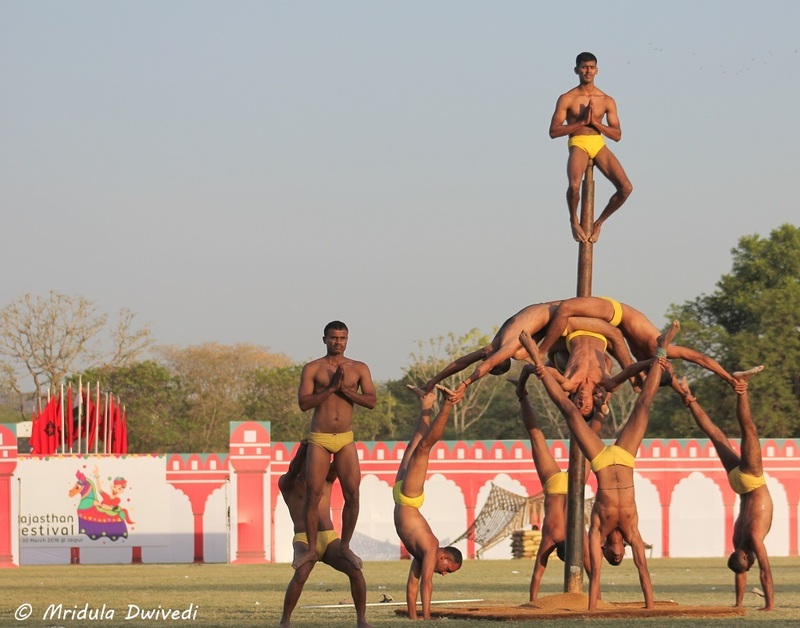 It was a dazzling display of power, fitness and sheer dare devilry which left me truly captivated! 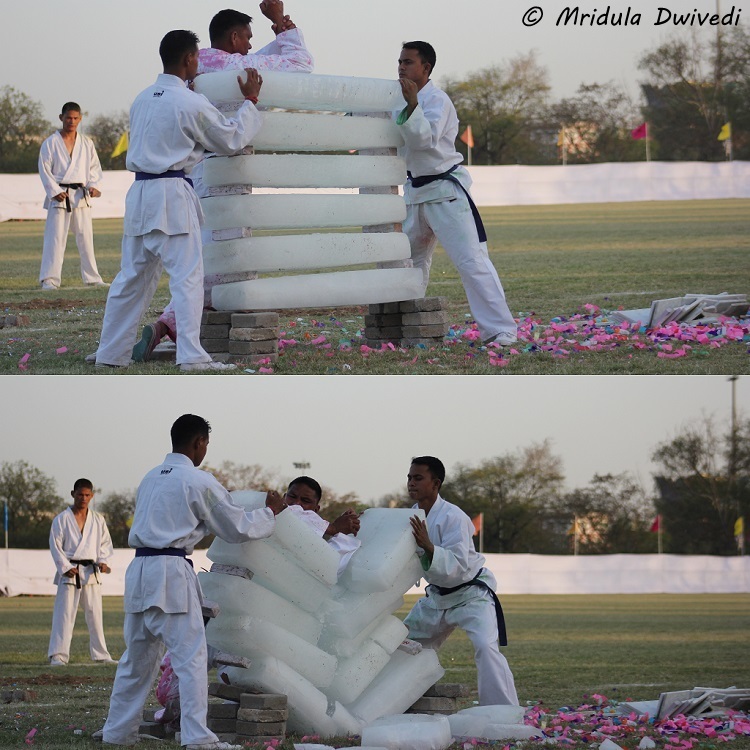 The show had horse riding, sky diving, battle situations, karate, traditional martial arts, dog show and much more. To achieve that level of fitness and skill takes real efforts and dedication. I came back from the show truly impressed. I also promise that there is going to be a separate post on it later on the blog. 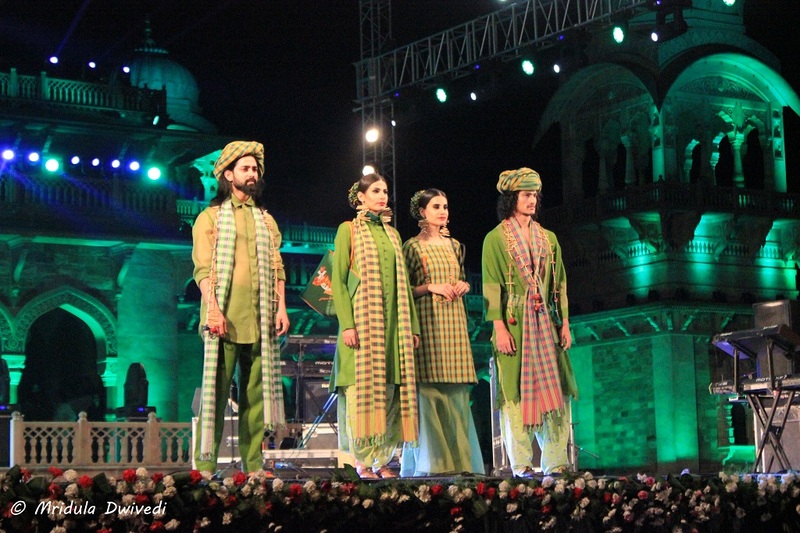 The fashion show and the concerts were organized at the gorgeous Albert Hall Museum. It was lit spectacularly at the night. It was a magnificent backdrop which added to the glamorous events. 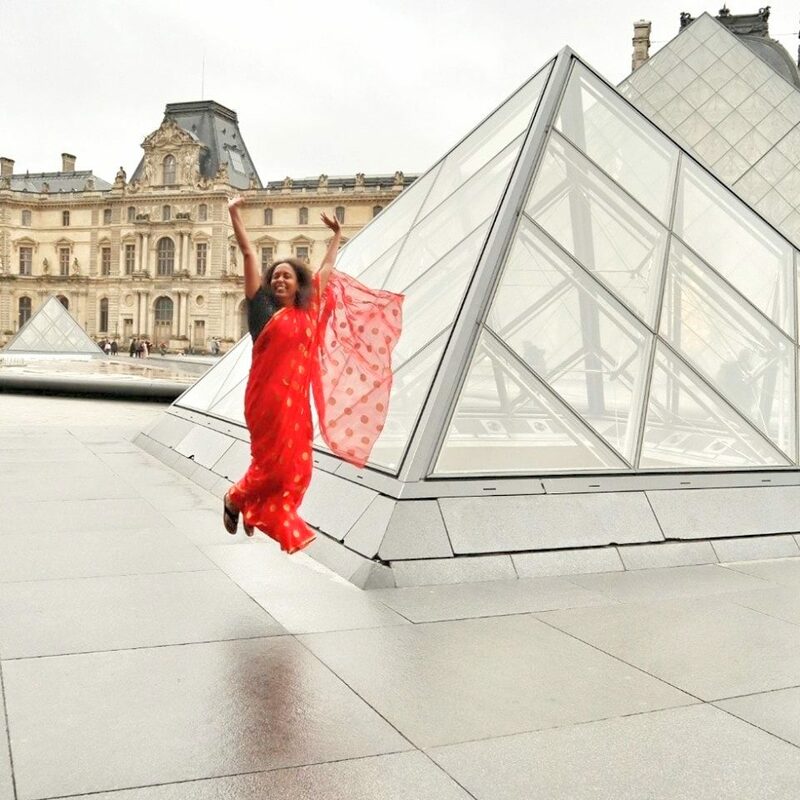 The fashion show was organized in collaboration with the Bangladeshi designer Bibi Russell and Rajasthali. While I am no connoisseur of fashion but I liked what I saw. The pinks and the greens were eye catching, the models looked gorgeous and the backdrop was making everything look grander. However, I am equally sure I would not be able to carry of even one the dresses displayed! I saw two concerts at the Albert Hall. 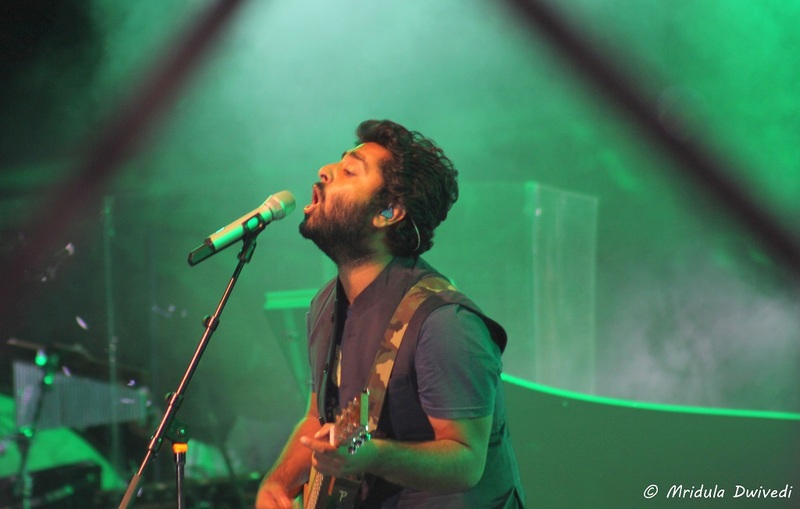 On the evening of 28th March Arijit Singh, the Bollywood singer, held the audience spellbound. 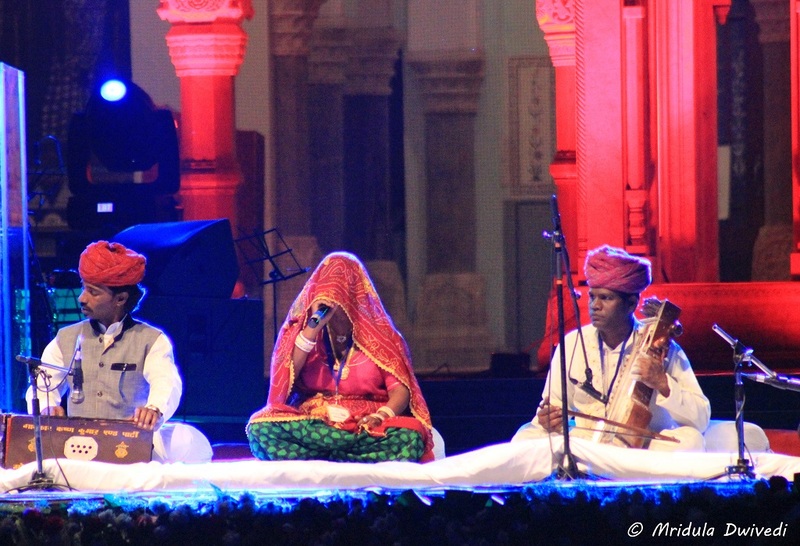 On March 29 Bhanwari Devi, the folk singer of Rajasthan opened the proceedings. 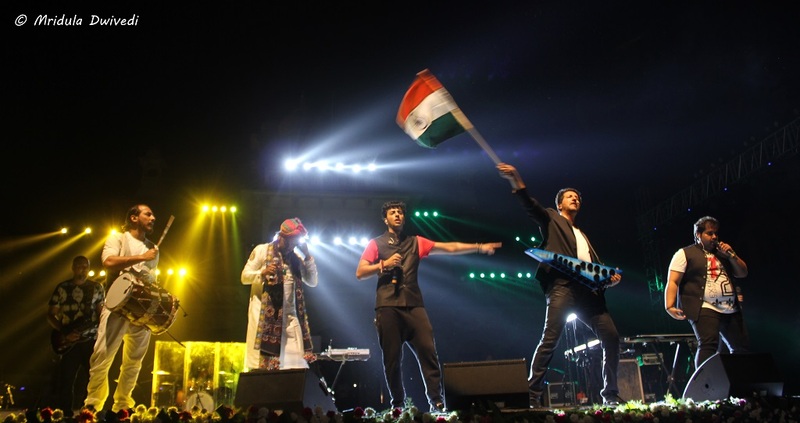 It was followed by the fasion show and then it was Salim Sulaiman, again from Bollywood, who entertained the audience. The shows were a revelation for me. As I had a media pass I could literally walk up to the edge of the stage to click pictures! I should stop getting surprised with this, after all I had the media access to the Pope’s mass in Jordan too, but I was still quite thrilled with the closeaccess. I have to admit for Arijit Singh’s concert I was still quite timid, I clicked pictures from side that was closest to my seat. But by the second day I was shedding my inhibition. I crossed over to the other side to get my pictures of the Salim Sulaiman concert. 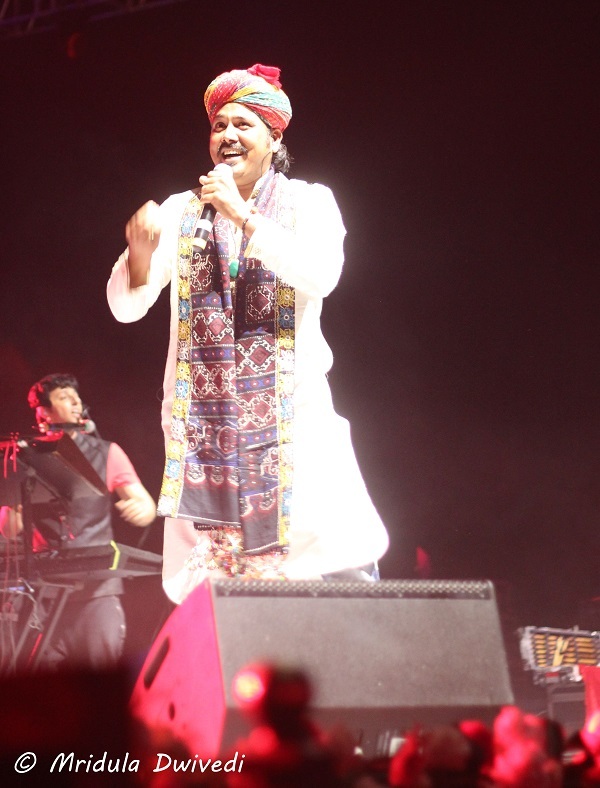 Mame Khan of the Coke Studio also performed with Salim Sulaiman. The finalist of Indian Idol were also performing in the same show. While I was walking out after the Salim Sulaiman concert I heard a commotion in the direction of the Albert Hall. There were two cars parked quite close to where I was standing. I then saw Salim and Sulaiman literally running to the cars and then getting whisked away! I didn’t expect that to be a part of a celebrity’s life! But in the end I think, I came back most impressed by the army pageant! They are really skilled, they are the real dare devils!